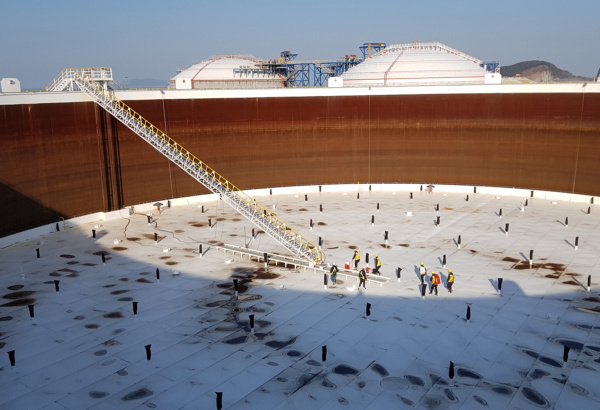 External and internal floating roofs in storage tanks include different types of rim seals that allow the movement of the floating roof against the tank shell. 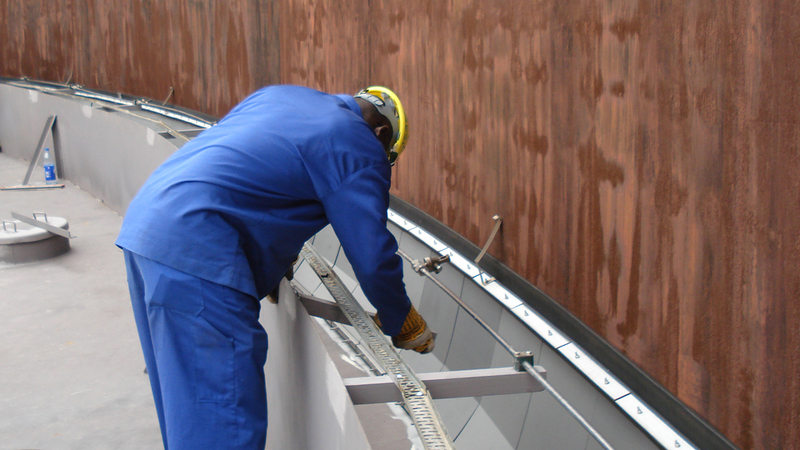 This rim seal area is prone to many hazards such as lightning and sparks produced by friction or static electricity. 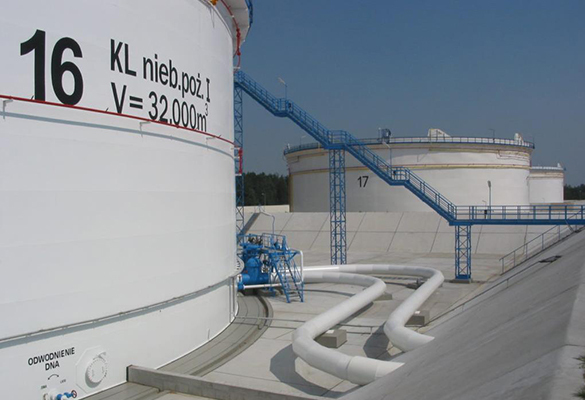 These hazards can easily cause a fire to develop undetected hidden by the tank shell until it reaches a dangerous intensity and possibly burn out of control. 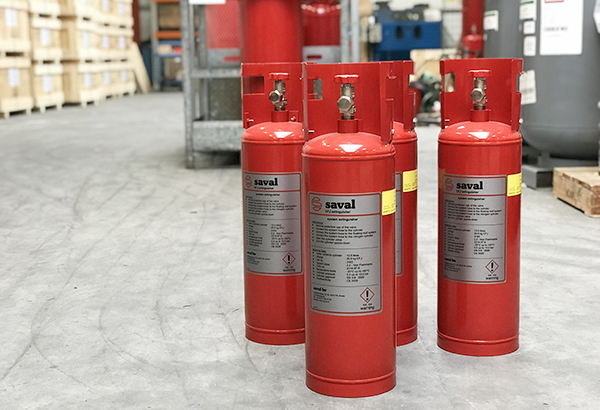 Saval as a tank protection specialist manufactures the best gaseous fire protection system for all types of rim seal fires. The CFI rim seal system combines automatic detection and extinguishment which ensures that any incipient fire is extinguished within seconds. Developed together with leading oil companies. 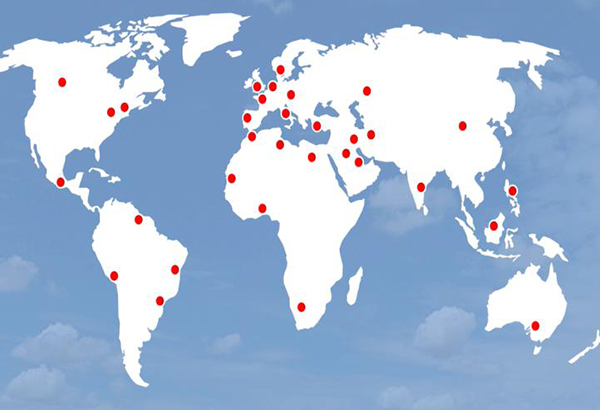 More than 4500 tanks installed worldwide. 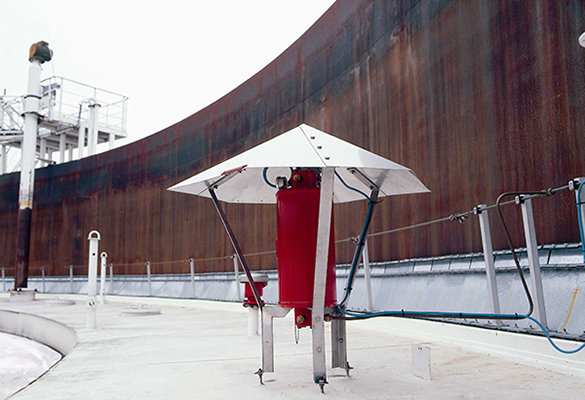 The thermosensitive automatic discharge nozzles are installed in the area above the rim seal. 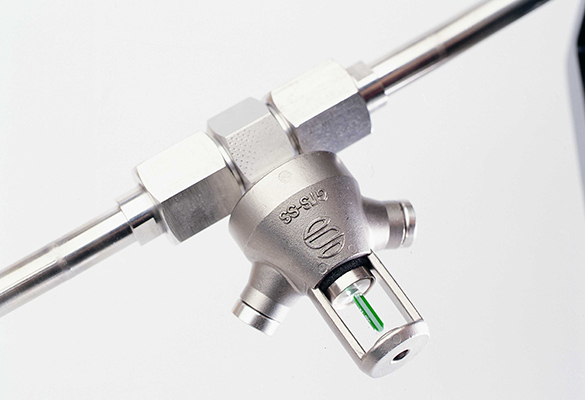 When a fire is detected by the glass bulb in the nozzle, the liquid CF3I gas is discharged in the fire area. The fire is extinguished within 5 seconds and an alarm is send to the Fire Brigade. 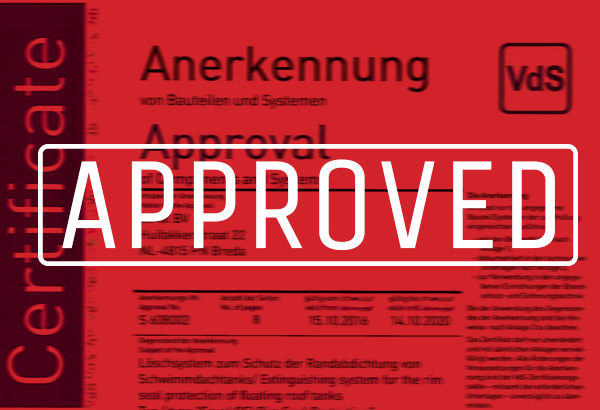 Approved system by VdS, an leading independent test laboratory for fire protection. Fast response time due to combined detection and extinguishing. Easy to install, even on live tanks. Wide operating temperature range from -20°C up to +60°C. WHERE CAN THE CFI RIM SEAL SYSTEM BE USED? Suitable for installation in Zone 0, area with explosion hazards. Internal and external floating roofs with different seal arrangements. 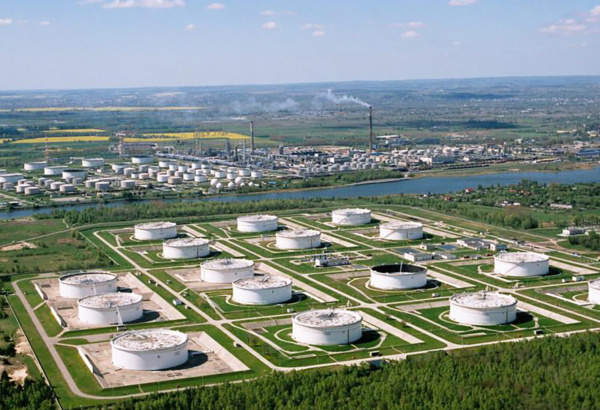 All types of stored products and fuels including refined products, alcohols and gas-condensate. The CFI rim seal system is a pre-engineered modular system comprised of 4 main components: the nozzle with detection, the CFI tank, CF3I gas and the fire alarm panel (optional). The fast-acting nozzle combines detection and extinguishment. 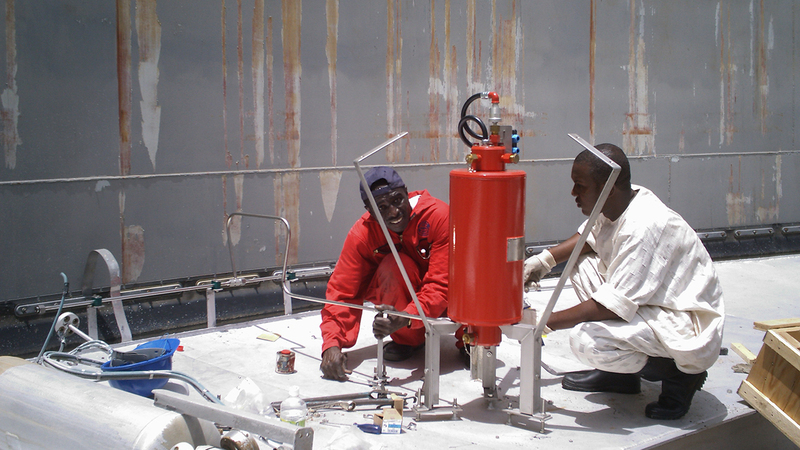 The nozzles are installed above the rim seal at two meter interval distance and connected with prefabricated pipe elements. 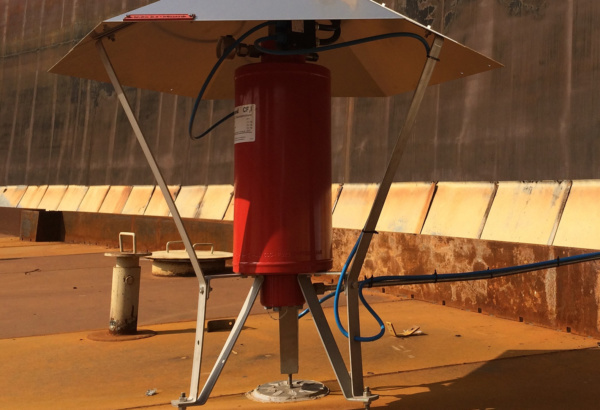 One section of nozzles can protect forty metres of tank circumference and provide 24/7 fire protection. 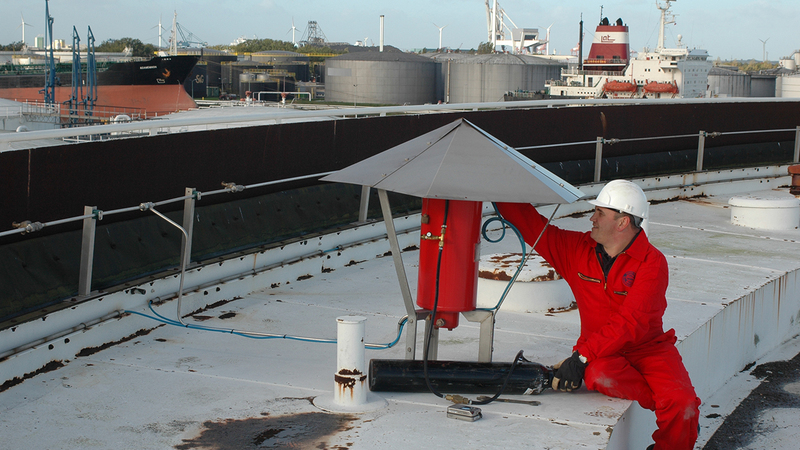 CF3I gas is stored in a high-quality container that is placed on top of the floating roof. 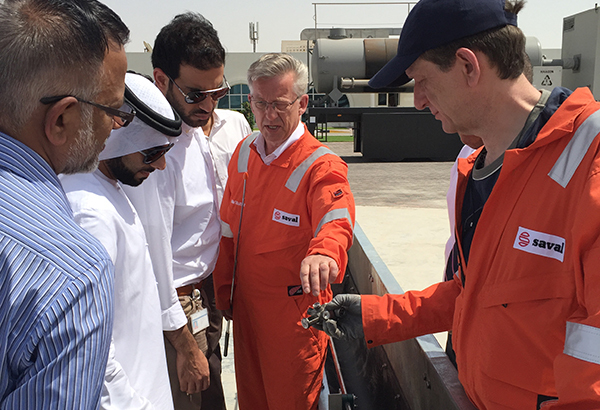 Every container feeds one forty meter section and is equipped with a magnetic level switch and a pressure switch. Immediately after system discharge, both switches will send a fire alarm signal. CF3I (Trifluoroiodomethane) is a gaseous extinguishing agent. It breaks the chain reaction of the combustion through an anti-catalytic process. 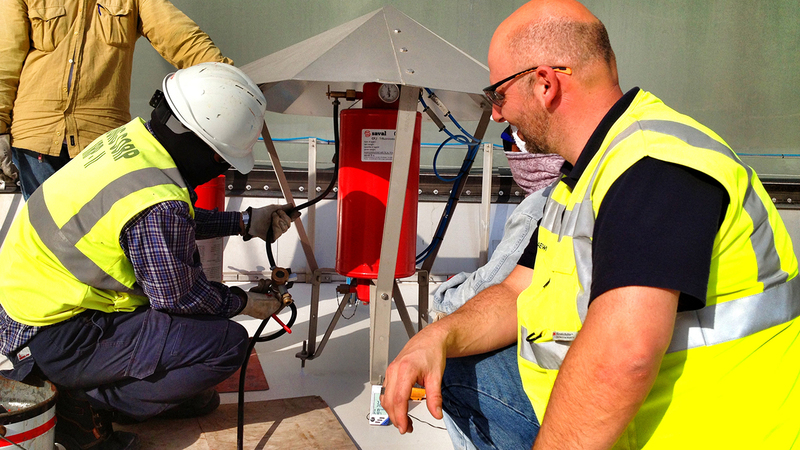 The gas molecules fall apart within one day when exposed to sunlight, therefore it has no GWP/ODP. CF3I has several approvals, eg. 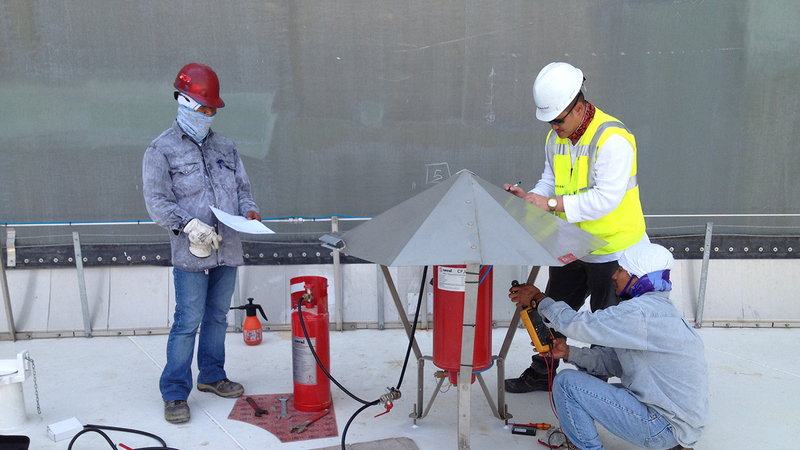 ISO14520-2 and NFPA2001. System alarms can be processed with our dedicated SK3000 alarm system. The unique graphic user interface provides a clear overview of the system status. The SK3000 has a wide range of software interface options available for interconnection with other fire alarm systems and supervision systems. 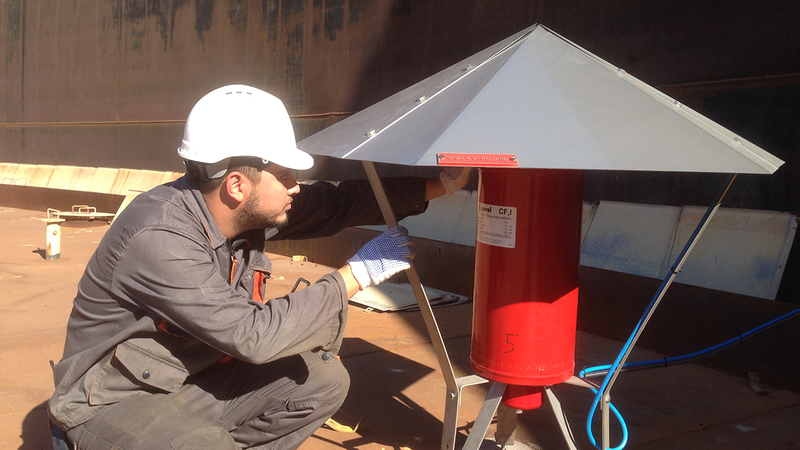 With its clever design, high grade materials and infinite life time of the extinguishing agent, the maintenance and repair costs are negligible. 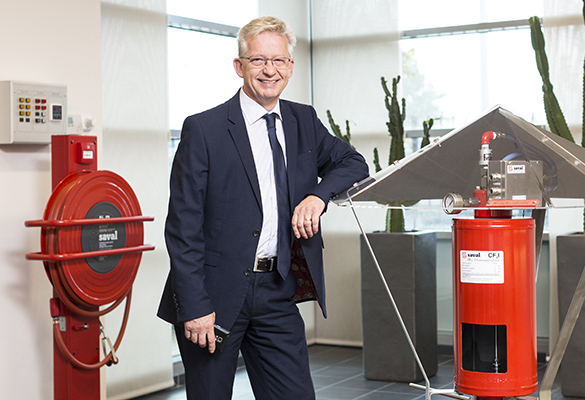 Typical total cost of ownership is very low, especially in comparison with traditional foam extinguishing systems with or without pneumatic detection. The CFI rim seal system is the only rim seal fire protection system with a full certification by VdS. This approval is the result of many years of extensive research and more than forty rigorous live fire tests in challenging weather conditions simulating wind speeds and temperatures. a fire detected and extinguished in 5 seconds. we demonstrate the system on location, because seeing it = believing it. please contact us and we would like to tell you more!